We are extremely happy to have Michelle Lindblom's wonderful artwork gracing our showroom walls. Michelle was born and raised in North Dakota, received her formal education from University of New Orleans and University of North Dakota. She spent 24 years sharing her love of art teaching at the college level. Michelle's approach to the creative process is intuitive. Once she begins a piece, it becomes a visual playground of colors, textures, shapes and movement; working through each piece, letting one action promote the next. Please come down and check out Michelle's beautiful artwork today. Natural Edge is proud to have Sheila Dunn gracing the walls of our showroom this winter. With the snow piled up outside we need the color her pieces bring. We will be holding a reception on Friday, January 6th from 4 - 6pm. Best known for her large, vibrant figure paintings, Sheila’s work explores the fluid relationship between figure and environment: how each continuously informs and affects the other. The event is free and open to the public. We hope to see you on Friday for snacks, drinks and a chance to talk with Sheila about her work. In honor of Small Business Saturday we are holding a one-day sale. All of our showroom pieces will be 10% off. So, come on in and find something gorgeous for yourself or that someone special in your life. We will be open 10am to 4pm for the event this Saturday, November 26th. Start your First Friday Artwalk (November 4th) in the Bend's Makers District with our reception for our Fall artist, Mary Medrano. Mary will be at Natural Edge Furniture on November 4th sharing her work. In addition to her paintings she will be bringing original prints to sell. With the holiday season right around the corner, it is the perfect time to purchase something locally made for yourself or someone special. 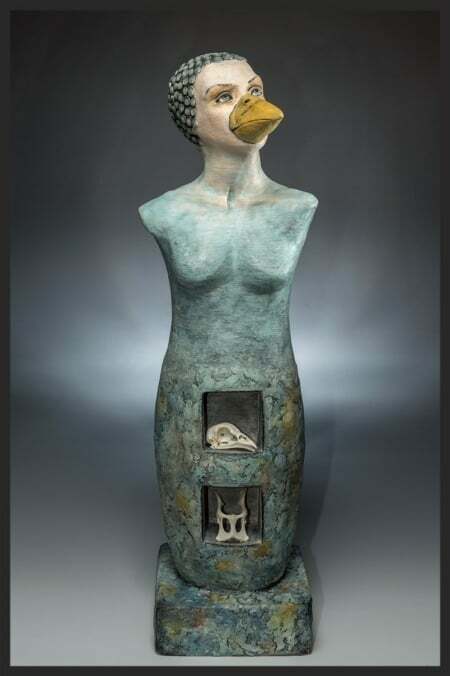 Mary's work, inspired by animals, utilizes a variety of new and recycled materials including acrylic paints, oil pastels, paper, photographs, fabric, graphite and ink. For more information about Mary and her work you can visit her website. Complimentary refreshments will be served, along with light appetizers at this family friendly event. We hope to see you on the 4th. We are blocking off roads, avenues, boulevards and lanes for Bend Open Streets, an event to promote healthy, active living by opening the city’s streets for people to walk, bike and roll, while discovering the joys of active transportation in a safe, car-free environment. The event will take place all across the Orchard District which stretches from the Pilot Butte area to highway 97. Bend's Makers District and Natural Edge fall into the district and will be actively participating in Bend Open Streets. There will be treasure hunts, miniature golf, human foosball, a pop-up Maker's Market and many, many other events along the course. Stop by Natural Edge Furniture for Addy Mac's ice cream and free hot dogs. Living in Bend, a place with more craft breweries per capita than really should be allowed, it is surprising that it took us so long to make a bar stool. We started tossing the idea around almost a year ago and came up with a few ideas, but then work got in the way of things. The base can be just about any color you might desire. We revisited the idea last fall. Intense research at bars around town, the state and in at least one South American country ensued. It was tough, demanding work but we approached it with the gusto we bring to every project. The result of our many hours of research is, we think, a great bar stool. The hand-sanded, bum cradling curves of the black walnut seat. It's like sitting on chocolate...yum. Actually sitting on chocolate isn't very yummy but you get the idea. We wanted something with clean, simple lines. It had to be sturdy enough for day-to-day use, but light enough to easily move around. We weren't looking for a behemoth with a swiveling cushioned seat and a back and arms. This was for sitting, not sleeping, which we discovered during our research, is not a good thing to do in a bar stool. The seats can be from any of our local, salvaged hardwoods. The bases can be raw steel or powder coated to any color from matte black to eye searing orange. Next time you are in the shop come on in and try one out. We are always looking to try new things. The complications and failures give us a good reason to swear. 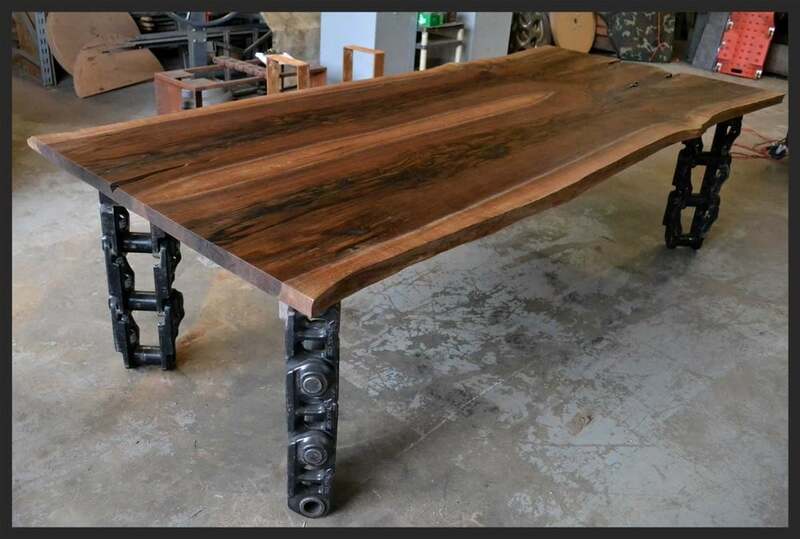 This month's piece, which we have nicknamed The River Table, is one such piece. Figuring out how to inlay a 1/2" piece of organically shaped glass so that it and the wood slabs meet smoothly took a bit of time. There might have been some saucy language used at times, but we feel it was worth it. The glass is inlayed between two book matched slabs of heavily figured maple. We also threw in a few butterflies to stabilize the ends. The result is pretty stunning. We don't think it will be in the showroom for long. We also recently finished a similar, but larger custom piece for a customer. There was less swearing with that one so we must be getting better at this glass thing. 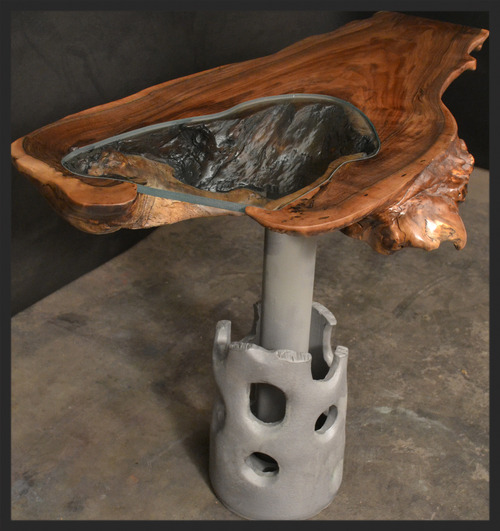 We are very pleased to have Karen Ruane as Natural Edge Furniture's Spring artist. Karen is a graduate of the art program at the University of Arizona and a co-founder of The Wilds, a co-working space for artists and creatives in Bend. Her work will be hanging through July. We will be hosting a reception for Karen in the evening on Friday, June 3rd. Feel free to come down for the reception or during our regular hours to view her wonderful pieces. Her work will be hanging through July. We will be hosting a reception for Karen in the evening on Friday, June 3rd. Feel free to come down for the reception or during our regular hours to view her wonderful pieces. As we get older our toys just get bigger. We just unwrapped our brand new Lucas Slabbing Mill. The mill will allow us to cut slabs up to 6 feet wide. We will get down to milling. We should have big slabs from this mill available after they have time to dry, maybe 2018 or 2019. "Orange is the happiest color"
"Orange is red brought nearer to humanity by yellow"
OK, so that last one wasn't really about the color orange but there are surprisingly few quotes about a color that has no rhyming words. 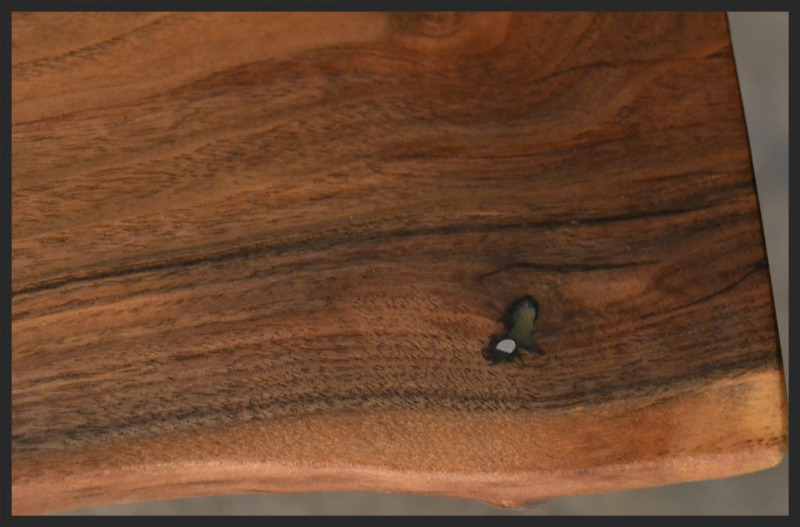 And, anyway, we kind of see the wood and base improving on each other in this piece. Maple top, salvaged steel base and a little color. Our newest neighbor here in Bend’s Maker’s District is Cate Havstad and her business, Havstad Hat Company. Cate makes custom, handcrafted hats out of the finest fur felts. She produces them in her 32-foot airstream workshop that, as of a month ago, is parked across the street from Natural Edge. One important part of the process is the wood hat form. Cate makes one to match each customer’s hat measurements. Typically balsa or a similar soft wood is used. We have a good supply of cottonwood that came from a tree we recovered in Bend last year. It fell over during a windstorm (We love a good windstorm!). So, we are now making the rough hat forms for Cate and then she is doing the final shaping for each one in our workshop. We love it when we can work with other local makers and artists. For more information about Cate and her beautiful hats click HERE. To find out more about Bend’s Maker’s District follow the link HERE.